In the current issue of Yankee Magazine, which for decades has been a welcome sight in the mailbox, a recipe for the summer specialty of popovers, at the non-profit Common Good Soup Kitchen in Southwest Harbor (a town on Mount Desert Island in Hancock County), Maine, was a reminder of my mom’s popovers cooked up once a year at Thanksgiving. I have held my mom’s memory close for more than 25 years, and on Thanksgiving Days in the past, I can recall her little bit of anxiety on timing the popovers to be hot out of the oven, just as the roast turkey was ready to be carved up for the annual feast. 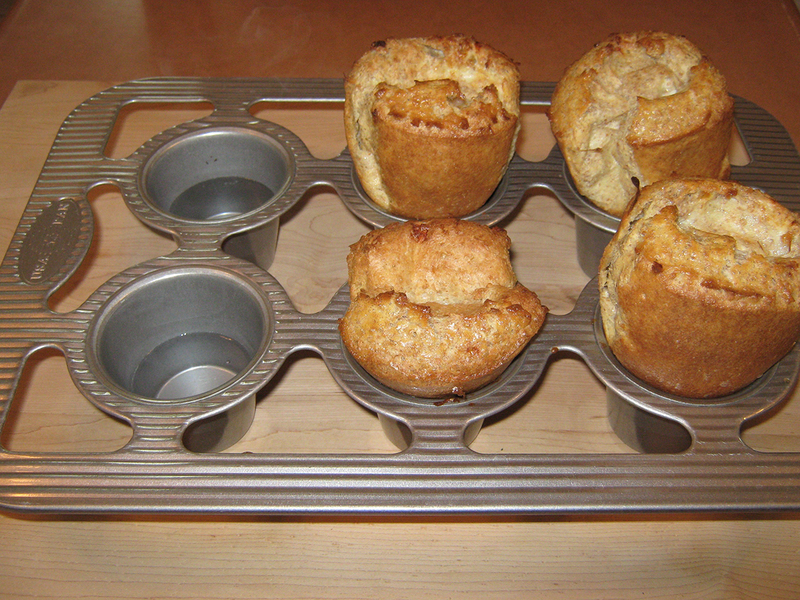 But I haven’t had a popover for decades, so the story in Yankee Magazine prompted some nostalgia for mom’s popovers. 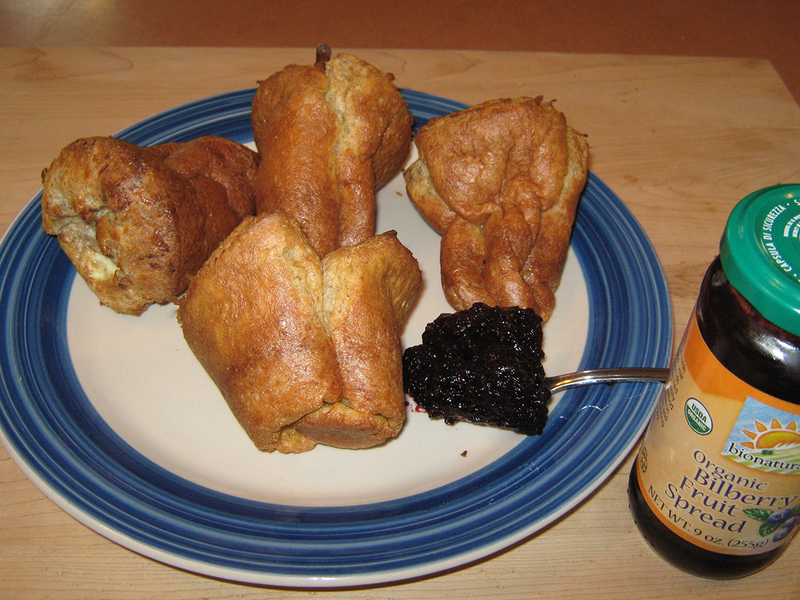 Coastal Maine’s inspirational Common Good Soup Kitchen’s popovers, as described in Yankee Magazine, are hot and golden, with a perfect crunch on the outside, airy and tender on the inside- and even better with a dollop of house-made blueberry or strawberry jam. Mom’s were too and this recent Mother’s Day, this aging baby boomer decided to bake up some popovers. And Common Good Soup Kitchen’s amazing all-volunteer staff, which bakes 400 to 500 popovers every day from mid-June through Columbus Day weekend for locals and summer people, is a story that deserves to be spread and perhaps become a model for other community soup kitchens. There are no prices set at the Maine soup kitchen, with customers invited to donate whatever they feel is appropriate. So with the soup kitchen’s recipe in hand from Yankee Magazine as well as the popover recipe from the latest edition of Joy of Cooking by Irma S. Rombauer, Marion Rombauer Becker, and Ethan Becker (New York, NY: Scribner, 1997), an earlier edition of the cookbook was a favorite of dear mom, I decided to give it a try. I will confess, the first batch turned out like biscuits, not popovers, because I failed to use all purpose flour and in error used 100% pastry flour. Brochures printed up by the National Co+Op Grocers, available at my hometown food co-op, Honest Weight Food Co-op in Albany, NY, include one on Flour. The descriptions provided under Types of wheat flours for all-purpose flour and whole wheat pastry flour provided the explanation why the first batch did not rise up into high, crusty, hollow beauties in Joy of Cooking’s terminology. Pastry flour or soft whole wheat flour is milled from soft winter wheat berries, a different variety of wheat than the one used for bread baking. It has the ability to absorb more fat making it ideal for pastry and cake making. All-purpose flour is a blend of pastry flour and refined bread flour, and the bread flour which is ground from hard red spring or hard red winter wheat berries made all the difference in turning out high, crusty, hollow beauties the second time around. Despite this culinary error, baking up a batch of popovers is extraordinarily easy with simple ingredients if you have a popover pan. And The Cook’s Resource, Different Drummer’s Kitchen in Albany, NY had the perfect popover pan, USA Pan’s (A Bundy Family Company) six Wells, Commercial Bakeware. With its deep, conical wells, this pan produced beauties, though the wells are so deep, the soup kitchen’s recipe for 6 popovers only filled 3 of the wells with the proper amount of batter, according to the Joy of Cooking’s recommendation of two-thirds to three-quarters full. The soup kitchen’s recipe recommended filling the wells one-half full, and also noted that a muffin tin is fine-the results are just a little less lofty. But I decided to stick with lofty, and I was able to fill three of the wells about three-quarters full of batter, and a fourth well, almost one-half full. All popped over the pan, but three were truly lofty, and all delicious: flaky, eggy and tender inside (big-time comfort food). 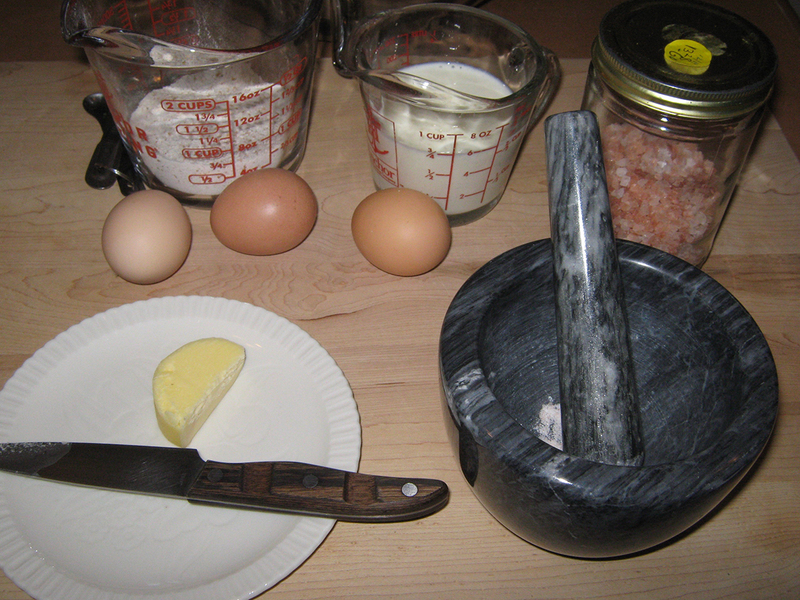 The recipe below tweaks Common Good Soup Kitchen’s with some additional tips from the Joy of Cooking’s recipe. 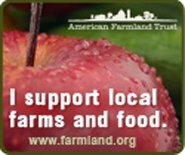 I also used locally sourced ingredients as noted. 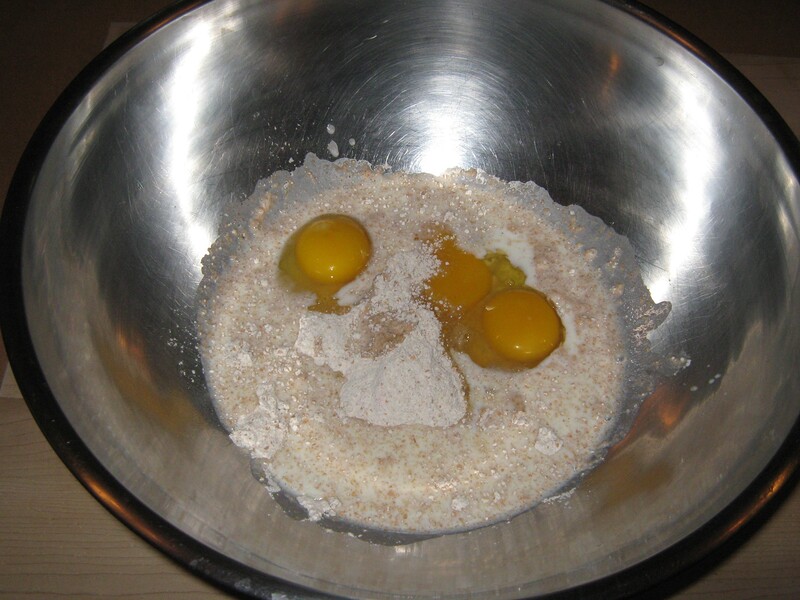 Put popover pan in the oven while preparing the batter. Remove the hot popover pan from the oven, and put a slice of butter into each well to melt. (I used only 4 of the pan’s 6 wells, so I put a sliver of butter in only 4 wells. Fill any unfilled cups one-third full with water so that the pan does not burn. Bake for 15 minutes at 450 degrees, then reduce the heat to 350 degrees and bake for 20 minutes more until popovers are puffed and golden brown. The total baking time of 35 minutes specified above was just right: Perfect popovers.